Semi-double, up to 4″ diameter. Successive flushes of bloom spring, summer, and fall. Keep moist until established (usually requires one month to establish). Average water needs during growing season. Appears to tolerate highly saline irrigation water when drip irrigated. Developed by Dr. Griffith Buck at Iowa State University. Parents are Seedling x ‘Prairie Princess’. One of the best of the carefree shrub roses developed by Dr. Griffith Buck at Iowa State University to withstand the cold and long winters of the Midwest, Carefree Beauty has also proven to be an excellent choice for gardens in Texas that are challenged by hot, dry summers. 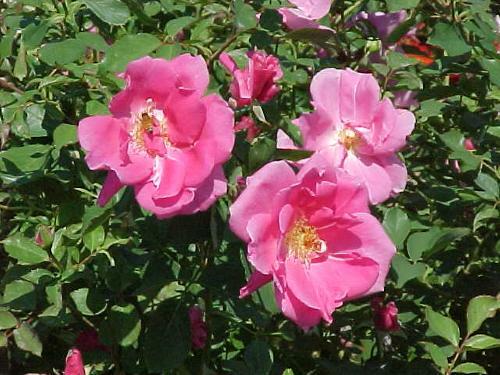 Carefree Beauty was named 2006 “Earth-Kind® Rose of the Year” by the Texas AgriLife Extension Service and is also recommended by the University of Minnesota. 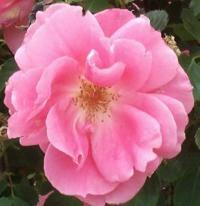 Introduced in 1977, this rose was known in Texas for several years as “Katy Road Pink” after it was “found” on Katy Road in Houston. It fast and furiously produces successive flushes of deep rich pink blossoms from spring until frost. The flowers open flat with a few irregular, loose petals at the center and an occasional white stripe running through them. Large orange hips are produced from nearly every flower. The rich color of the shrub makes it a natural choice for uses in groupings of 3 to 5 plants in locations to which you want the viewer’s eye to be drawn. Carefree Beauty has a form that creates an attractive accent for perennial borders and beds. This selection can be used in mass to create a breathtaking sea of color or as a specimen plant providing a focal emphasis in the garden. Carefree Beauty also creates large hips which are an additional asset.